So you’ve taken the plunge and jumped out of the plane. You felt the air whizzing past your face and the view from the air was amazing… but after a few more jumps it is likely that you have started to lose the thrill like feeling that came with your first few jumps and are wondering what to do next. This is where extreme skydiving specialties and skydiving jobs come in! So much more thrilling than a tandem jump, these specialties are sure to make your spine shiver with a mix of terror and excitement! Free flying is the ability to move through different static positions whilst controlling your body during the free-fall stage of your jump. Maneuvers such as head down, back flying and sit flying can all be learned to make this stage even more interesting and these all help to control your speed and trajectory. Exit rolls and tumbles can also be deployed during free falling but remember to open your parachute as you near the right altitude! Formation skydiving is literally creating art whilst your freefall. You have complete creative freedom during formation skydiving and as you gain experience you will be able to freefall with other skydivers as you work with them to create and hold awesome formations. The record for this type of skydiving is an incredible 400 man dive which was maintained for just over 4.25 seconds in Thailand. Freestyle skydiving is basically the same as formation skydiving except it is a solo performance. Complete creative freedom is once again yours and you can incorporate anything from acrobatic stunts such as tumbles and rolls with graceful maneuvers to create a stunning one man air show. Make sure that you take a friend skydiving with you as you freestyle as you are sure to have an awesome video opportunity on every dive. This is a more extreme version of skydiving and involves a board that is very similar although slightly smaller than a snowboard. This isn’t the easiest skydiving specialty to practice as managing the board can be difficult – it will take not only skill but a great sense of balance too – although when you perfect it you will be the epitome of cool! Like freestyle skydiving, I would advise taking a partner along to take video evidence of your awe defying stunts. If you have the guts to jump out of a plane on a regular basis, you might as well make some money out of it right? If you want to make a decent paycheck at the end of a week you might want to look into becoming a freefall photographer. Falling with a camera is much more dangerous than skydiving without one so most freefall photographers have usually completed over 1000 jumps before branching into this specialty. However once you get the hang of things you can start charging your fellow divers for photos and of course, you will get to skydive for free! You can expect to earn around $30,000 a year if you make this a full time career. The job of a packer is available to anyone who just wants to make a bit of extra cash to fund their jumps. 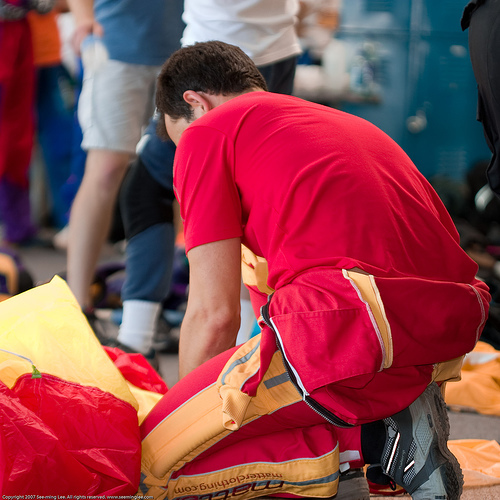 This job generally entails packing a parachute into a bag and although it is not taxing, it is vitally important that it is done correctly. A full time packer can expect to make around $30,000 a year although this job is generally part time and taken by people who are looking for some extra money to fund their jumps. The job of a manifester is a highly important one as the manifester at a skydiving center is generally the person who holds everything together. It is a high pressure job and it involves greeting new jumpers, organizing paperwork, dispatching airplanes and coordinating drop zone activity. Usually this job is performed by the partner of a skydiving instructor or the owner of a dive center due to the high stress and relatively low rewards. This is usually a full time job and wages vary depending on the size of the skydiving school. 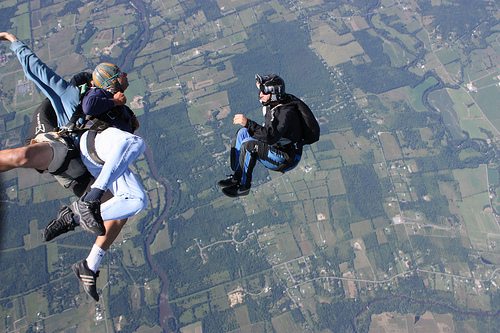 The above are by no means the only ways to continue your love of skydiving on a regular basis. You could also look into being an instructor, a pilot (if you’re willing to get your license) or even a professional skydiving acrobat artist. There are also secretarial and other similar jobs that can be performed in a skydiving center although most of these will not actually involve you in the actual jumps. It all depends how much you want to earn and how often you want to skydive. If you do any of the above jobs or if you have had any experience in the skydiving specialties I would love to hear from you… maybe we could add some of your experiences to our blog! This entry was posted in Air Sports, Sky Diving and tagged Jobs, Sky Diving. Bookmark the permalink.